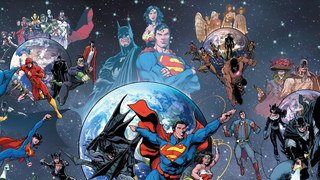 The climax of DC’s recent comic book event Convergence confirmed one thing—the return of DC’s long-established comic book multiverse, once cut off by 2011’s “New 52” reboot, leaving readers with a billion questions. Now the company has answered a few of those and made its new continuity a little clearer... sort of. We just came off the convention trail. During that, I made the point to say that so many people are looking for definitive answers on, yes or no: Is it loose continuity or is it tight continuity? Is it going for diversity or is it going for the core line? My answer to all of that is going to be yes! We’re going for it all! THAT’S NOT HELPING, MR. DIDIO. I describe it in three concentric circles. At the center, you have the core continuity that drives the story, drives the characters, that really defines what the universe stands for — basically, the films and TV shows strive for it too, that connective world. Then you move out from there and you have the stories that are associated with that core continuity but are able to move into directions where they stand alone, but they still feel connected to the core universe, because they share a lot of the basic conceits of the shared universe. And then you move out to the furthest circle, and that’s where you find a lot of the more fringe ideas, the more risk-taking, and different types of approaches — being able to try different things with different characters, with different artists, with different voices, different tones. And although they share the names of characters that you’re familiar with, they really take on a life and a direction of their own, and we let them move in that direction so that they can breathe and take their own form. So essentially, DC’s multiverse will remain as a tool that binds the whole company’s output together, but instead of being a particularly strict guideline to all things comic canon, it’ll serve as an easy way for readers to actually see what matters, what doesn’t and open up a chance for writers and artists to play with some of those “elseworld” scenarios that were largely cut off during the New 52 era. That’s probably a great thing—not only does it mean that there’ll be opportunities to tell out-there, wacky stories about these iconic characters that can comfortably sit alongside the usual comics, but it’s also nice acknowledgement that DC aren’t taking everything too seriously when it comes to canon. After all, it’s a brain-pulping task to try and make sense of it at the best of times.